A great deal of expense and effort goes into the production of fertile goose eggs, so they must be handled with care and it must be assumed that each egg is fertile and will produce a healthy gosling. Successful incubation begins with the collection of sound, clean eggs from the nests. After collecting and drying the eggs, any dirty eggs should be individually cleaned with a brush or with sandpaper. Although washing of hatching eggs is not recommended, eggs which do not come clean by dry cleaning can be scrubbed individually in water at 40°C (note that the water temperature must always be warmer than the temperature of the egg). A disinfectant such as sodium hypochlorite (Na OCl) can be added to the water. Eggs should be collected in plastic trays, or any non-porous, easy-to-clean collector so that any bacterial contamination is not passed from egg collection to egg collection. Immediately after the eggs have been cleaned, they should be fumigated on the farm before being transported to the hatchery. This immediate fumigation is very important. The greater the delay in fumigation, the less effective it will be because both Aspergillus and Salmonella can penetrate the shell. Fumigation is normally done using formaldehyde CH2O which is a gas sold commercially in a 40 percent water solution (37 percent by weight) under the name of formalin. It can also be purchased in powder form when it is known as paraformaldehyde. The eggs are fumigated by putting them in a small room or chamber that can be tightly sealed as formaldehyde is very toxic, and the formaldehyde is then released into the room or chamber. To release formaldehyde gas from paraformaldehyde, a thermostatically controlled heating device is used. The manufactures' instructions regarding the amount and temperature must be followed. To release the formaldehyde gas from the formalin, potassium permanganate (KMnO4) is added to the formalin, at a ratio of 1 g potassium permanganate to 2 ml of formalin. This must be done in an earthenware crock or metal container as the heat generated by the reaction could break a glass container. The recommended amounts for 2.8 m3 (100ft3) of cabinet space are 60 g potassium permanganate and 120 ml formalin. If the eggs are densely packed in trays, these amounts should be increased to 75 g and 150 ml respectively. Where neither formaldehyde nor any other fumigant is available, solar radiation can be used as it has good disinfecting properties. The eggs must be placed in single layers so that they are well exposed to the sun and care must be taken not to use a dirty place where the eggs could pick up more bacteria than the solar radiation destroys. Care must also be taken to not overheat the eggs. The hatchery building should be isolated from the goose flock, constructed in such a way as to protect the incubators from sudden temperature changes and should provide good ventilation for the incubators as the oxygen requirement of the growing embryo is high. an area to which to take the goslings from the hatching trays and to use for gosling identification, sexing, vaccination, etc..
After the eggs have been fumigated they can be stored prior to incubation. The recommendation is to store them at 10-15°C with a relative humidity of 70-75 percent. The eggs should be turned (90 degrees) six times per day during storage. If at all possible, goose eggs should be set twice a week and not stored for more than four days before incubation. Recent work on periodic warming of goose eggs during storage (Table 5) indicates that periodic warming will improve the percent hatch of stored eggs. In the work shown in Table 5 the eggs were stored at 10-15° C up to day 14 and for the remaining ten days at 18-22°C. The relative humidity was about 75 percent. For eggs that received no treatment and remained under these conditions throughout the experiment, the decline in percent hatch was from 83.46 to 20.67 percent over the 24 days. The eggs that received periodic warming were warmed for five hours on the first day of storage and five additional hours every fifth day thereafter. 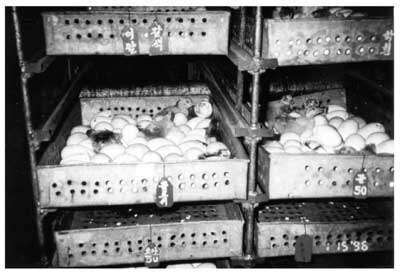 Thus eggs stored for ten days received ten hours of warming; those stored 17 days received 20 hours of warming and those stored 24 days received 25 hours of warming. These results clearly show that periodic warming of goose eggs during long term storage can increase the percent hatch and reduce the incubation time. There are two fundamental types of incubators that can be used for goose eggs. These are the larger forced-air type found in commercial hatcheries and the much smaller still-air type used for incubating small numbers of eggs. The incubation period for goose eggs is 30 days and, as with other waterfowl eggs, they have unique requirements during their artificial incubation which are not needed by other poultry species. From the fourth day to the 27th day it is a good practice to cool and humidify the eggs daily. It has been demonstrated many times that this has a positive effect on the total number of goslings hatched. This is probably related to the fact that in natural conditions, waterfowl leave the nest each day to bath and come back with moisture in their feathers. Most forced-air incubators come with specific recommendations for hatching goose eggs and the manufacturer's recommendations should be followed. However, the general recommendation for hatching goose eggs is that for the first 27 days, until the eggs are transferred to the hatcher, the incubator (setter) temperature should be maintained at 37.7°C with a relative humidity of 50-55 percent. 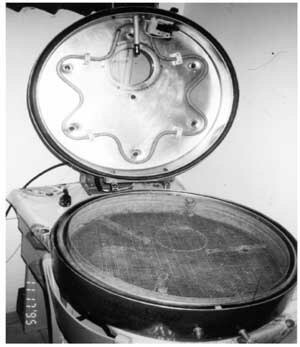 The eggs must be placed in a horizontal position in the incubator tray and turned 90 degrees every two hours. If the eggs are in a vertical position in the incubator tray, they must be turned 180 degrees every two hours. The eggs should be cooled each day during incubation by opening the doors of the setters for 15 minutes from days 4-27 and at the end of the cooling period the eggs should be sprayed with water or preferably with a bactericide solution. The temperature of the water should be 20-25°C. On the seventh day of incubation, the eggs should be candled with a bright light source to check, by transparency, that the embryos are developing normally. Any infertile eggs and dead embryos should be removed. On the 27th day of incubation the eggs must be transferred from the setter to the hatcher. Dead embryos should again be removed at this time. While in the hatcher the eggs are neither cooled nor sprayed with water and the temperature should be maintained at 37.5°C with the relative humidity at 75 percent. Hatching will begin on day 30 and the ventilation openings on the hatcher should normally be fully opened to allow the goslings to dry before being removed on day 31. Just prior to hatching the goslings will absorb the remaining yolk sac and this enables them to survive for over 24 hours without food or water if they are to be transported. However, in spite of this, it is strongly recommended that goslings be given feed and water as soon after hatching as possible. Still-air incubators can be very useful for hatching small numbers of goose eggs under a variety of conditions. These incubators are generally much smaller than the forced-air type and normally hold 10-100 goose eggs on a single level. Usually the humidity is provided by a pan(s) of water located below the eggs. It is important that the pan(s) be kept full of fresh, preheated clean water to keep the relative humidity at the right level. The water and the pan(s) must be kept clean because a layer of dirt or dust on the surface of the water will reduce the rate of evaporation and thus lower the relative humidity level in the incubator which will result in a poorer percent hatch. Unlike the forced-air incubators that must operate with electricity because of their fans and egg turning devices, many models of still-air incubators do not require electricity. Instead they can operate with a variety of heat sources since they have no fans or egg turning mechanism. Heat sources for still-air incubators can be straw or rice hulls, the traditional brick and clay incubator still found in some Egyptian villages, kerosene, natural gas or, of course, electricity. Almost any heat can be used provided there is some mechanism to monitor and/or control the temperature. Again, as with forced-air incubators it is vital to follow the manufacturer's recommendations for incubating and hatching goose eggs. Generally, the recommended temperature for setting and hatching is 39.4°C in still-air incubators. This is higher than that recommended for forced-air machines as there is no air movement. 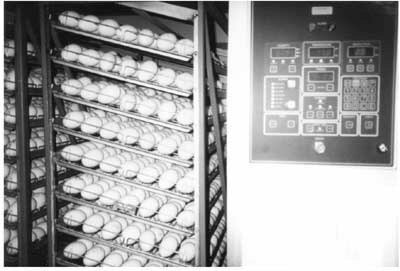 Since there is no automatic turning device in still-air incubators, the eggs must be marked on one side to show when they have been turned. They should be turned 180 degrees 4-6 times a day with the first and last turning being done first thing in the morning and the last thing at night. All eggs should be candled at seven days of incubation and the infertile eggs and dead embryos removed. Since most still-air incubators have only one tray due to smaller egg numbers and reduced air movement, this can mean that the eggs are set once a week in the same incubator. For this reason, the date that the eggs are set should be written on each egg with a lead pencil. Also, since eggs are generally set weekly and so the goslings will be hatching weekly, it is recommended to use a second incubator for hatching. In this way the incubator being used as a setter can be kept clean, and free from down, broken eggshells, etc. 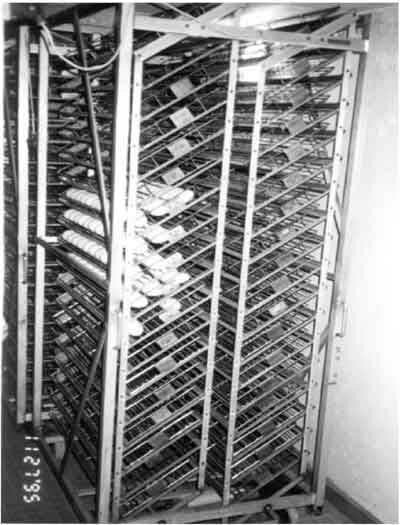 If the eggs are set weekly, the space required in the hatcher is only about 25 percent of the space required in the setter. With either type of incubator, a slight drop in temperature due to a power failure or an interruption in the supply of heat, although not ideal, need not harm either embryo development or percent hatch since regular cooling has in fact been shown to improve percent hatch. On the other hand, overheating can cause severe problems and must be avoided at all costs by opening the incubators to expose the eggs to cooler air if, for some reason, the cooling mechanism is not functioning or the ambient temperature gets too hot. If kept clean and there are no broken eggs etc., the incubators used as setters can be used throughout the laying season without being cleaned. It is only necessary to clean and fumigate the eggs before they are set. On the other hand, the hatcher must be washed and disinfected after each hatch. If disinfectant is not available, the hatcher should be washed well and put in the sun, as the ultraviolet rays will help with the sterilisation. Most female geese, if given the opportunity, will become broody and sit on and hatch the clutch of eggs (generally 10-12) they have just laid. This is not recommended. The reason is that while the goose is sitting on her eggs she is not laying. However, if natural incubation is the only method available it should be used but the goose eggs should be set under a broody hen, duck, or turkey for incubating. If it is known in advance that natural incubation will be used, sufficient broody birds must be identified in order to incubate all the expected goose eggs except for the last 10-12 eggs of the laying season which the goose can incubate. Normally a hen can incubate between 4-6 goose eggs, a duck 8-10 and a turkey 10-14. At one time, it was recommended that goose eggs being incubated by a broody hen have additional water applied to them during incubation to increase the humidity, however, it is now generally accepted that this is not required. The nest for the broody female should be clean and in a relatively dark area where she will not be disturbed. Food and water should be available. Eggs for incubation under broody females should be collected and stored as previously recommended. The eggs can then be placed under the hen, the duck or the turkey when she is broody. It should be noted that because of the size of the eggs, some hens could have trouble turning them. For this reason the eggs should be marked on one side as previously described and if it is noted that the eggs are not being completely turned, they should be turned manually, to 180 degrees, two or three times a day in addition to the turning that the hen can achieve. A broody bird may be able to care for newly hatched goslings for a few days. However, the recommendation is to remove them from the female at hatching and transfer them to the gosling brooding facility.